Nugent are an established charity with a 135-year history of helping those in need. They needed to reposition their brand, allowing them to continue to meet the evolving needs of those in their care, whilst upholding their distinguished legacy. Mashbo stepped in to deliver a complete brand refresh and digital strategy development to roll out across every part of the organisation. 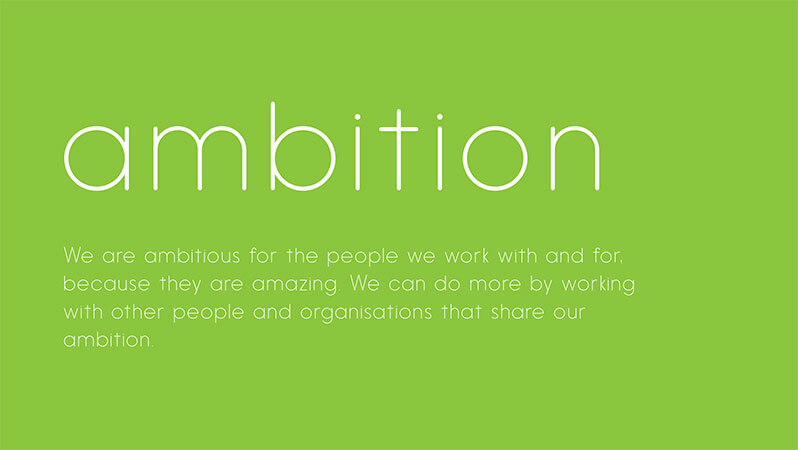 We made it our mission to become ingrained in the most integral parts of the organisation – engaging with stakeholders, trustees and board members to reposition Nugent as a brand and highlight its commercial potential. We helped the team to move away from Nugent’s purely traditional, religion-based foundations to bring them into the 21st Century whilst still upholding their core values. A modern brand needs to be flexible and applicable to every part of an organisation. We carried out extensive work to ensure the whole Nugent team was a part of a brand that they could be proud of and could be a part of going forward. Research and evidence was at the foundation of everything we did. We ensured that we had the evidence to fully back up our reasoning for steering the brand in a new direction. We carried out extensive research – gaining a true understanding of the Nugent identity through competitor analysis. This gave us the best idea of how to move forward with the brand and reposition them to put them on course to not only compete with, but also outperform their competitors. We carried out a substantial amount of research into Nugent’s competitors and spent a lot of time understanding why each one was a competitor in terms of their relationship to Nugent. We thoroughly analysed each of their competitors’ brands, getting to the heart of their brand story and values, as we planned to do with Nugent. We also critically evaluated each brand using a number of key consideration points – including the values associated with each brand, as well as their usage of the brand when interacting with service users through marketing and digital offerings. We presented our findings back to a group made up of Nugent staff, stakeholders and trustees and discussed every part of our competitor analysis with them. This allowed us to make them aware of what their competitors were doing with their brands and how Nugent could progress going forward to develop a brand that not just lived up to, but outperformed the brands of their competitors in terms of representing who Nugent are and what they stand for. The key part of this was that we were engaging people from every aspect of Nugent at such an early stage – meaning that they felt like they were starting on a learning process together as a brand and a team. The next part of the process was to make the Nugent team more comfortable with how the brand would progress, as well as why it was necessary and the effects that it can have for the organisation. We did this by analysing several case studies, and presenting these case studies to the Nugent team. We discussed brands that had undergone brand repositioning and looked at how they had progressed, with the effect this had had on representing their values. We then applied this to Nugent, and gave them our insight into how their overall brand name, which was at the time ‘Nugent Care’, broke down into several key aspects of the Nugent brand, which represented both their core values and day-to-day services. These were: Nugent Education, Nugent Residential, Nugent Family, Nugent Community and Nugent Support. This challenged them to think about the meaning of the Nugent brand in a new way and we encouraged them to start considering how this could be represented in a physical branding format. Through this exercise, the Nugent team began to understand how necessary the brand repositioning was. When it came to our vision for the brand’s future – we carried out further research before presenting back to the Nugent team. 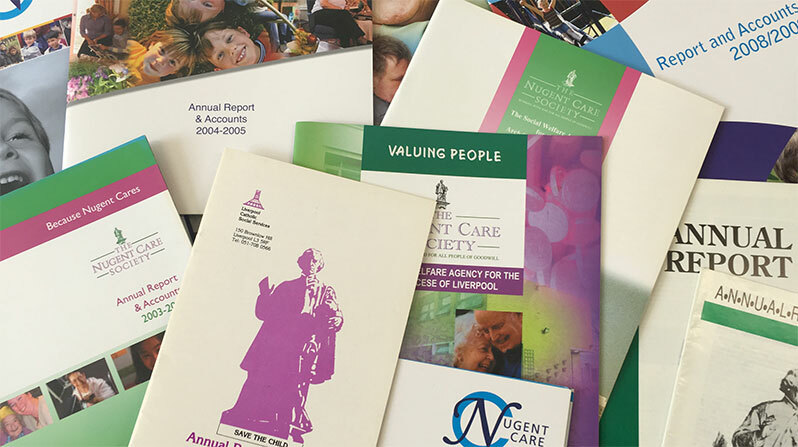 We analysed a range of archived collateral (such as flyers, campaign leaflets and annual reports) to gain an understanding of how the brand had been represented in the past. This helped us inform branding decisions going forward and gave us a solid foundation on which to base our suggestions for brand development. We presented our findings to Nugent stakeholders and trustees, again making them a key part of the transition from Nugent’s previous brand to their new one. We explained to them our thoughts about what Nugent represents – that it is much more than a one dimensional organisation that offers care. It was at this point that the name change from 'Nugent Care' to 'Nugent' happened the name, creating with it a number of departments (i.e. Education, Support etc) that defined clearer the amazing work that Nugent do daily. Not only did this provide Nugent with a potentially stronger positioning, but also made their values and services more transparent for the people that they help. Separating out Nugent’s service offering in such a way meant that we were providing Nugent with a clearer structure, meaning those who needed them could find what they were looking for quicker. Again, as our findings were based on in-depth research and understanding of the core elements of the Nugent identity, we provided the Nugent team with assurance that we wanted to uphold their ideals as much as they did. We took this vision and worked with the Nugent team to determine how it would align with other bodies and organisations in their world that weren’t necessarily their competitors. For example, we discussed how a refreshed brand that had been brought into the 21st Century would be attractive to commissioning bodies and people who were referring Nugent. We discussed how a brand whose structure and service offering would be more comprehensible to governing bodies such as Ofsted and Investors in People. Once the Nugent team started to envision this positioning, and where they would sit in their sector, they started to believe in taking their brand forward. After developing the vision and concepts behind the new brand, it was time to work on the visual elements and physical representation. The first aspect to consider was the typography for the new brand. The typography is the core element when it comes to branding, as it is what keeps the same, consistent story and feel throughout everything that an organisation produces – keeping people engaged and making their brand instantly recognisable. Our design team worked on a number of typography drafts to determine which represented the Nugent feel in the best way possible. At this stage, we presented these typography ideas without any development of a logo. Typography was more important at this stage in terms of representing Nugent’s ideas, and it allowed us to get the Nugent team thinking about the feeling behind the brand rather than getting fixated on the ins and outs of what the logo would look like. After developing these initial typography drafts, we started to do the same with colour palettes and considered the relationship between Nugent’s core values of support and warmth, and how this would translate through colour. We applied these ideas to ‘real world mockups’ – using example collateral to give an accurate representation of how the Nugent brand would be used during the day-to-day. Again, we were completely open and transparent and presented these initial ideas back to the Nugent team so they were part of this next step. Rather than just working on a brand and presenting to them on completion, we were involving them at every part of the process, meaning they were seeing the brand evolve in the same way as us. Following the stakeholder reviewing sessions, we continued to work on the visual elements of the brand, pulling in stakeholder feedback and allowing their views to challenge our designs. We took their thoughts on board and made it clear to them that it was them who owned the brand, this made it clear that they were actively changing and shaping the direction of the brand, rather than just being bystanders to its development. This was equally enjoyable for us – as designers we want our thinking to be challenged and we relish the opportunity to explore every possible angle. At this point, we had come to the stage where the Nugent brand needed to be refined and presented as a whole entity. We started this by going back to the core sub-departments that form the Nugent family. We presented the idea of the ‘Nugent Family’ to the Nugent team – who by this point were excited to see an overall visual representation of the rebrand. We discussed with them the iconography that we had developed for each of Nugent’s departments – developing, with the use of the colour palette that we had progressed, a unique identity for each of the departments. 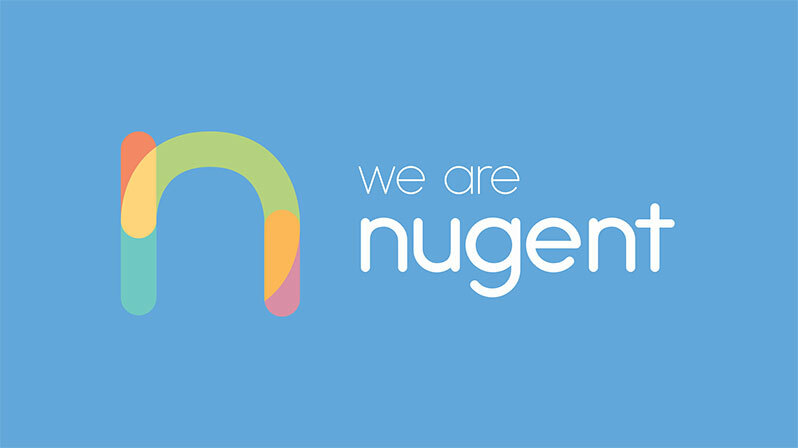 These departments each became a key part of the overall brand identity: ‘We Are Nugent’. The idea of every part of the Nugent brand being a vital one, that as a whole makes up the brand’s identity, went down extremely well with the Nugent team. They had come to realise that branding is more than a logo; they were excited to be part of the Nugent family and to sport this new identity going forward. This belief and passion for the brand meant that it would be carried out in the best possible way, and with assistance from our branding guidelines, we provided the foundation for Nugent to carry their new identity with pride. To ensure Nugent were fully supported with the transition to the new brand, we delivered a brand guidelines document to assist them with usage of the brand in future. The document is now being used by the Nugent Marketing & Communications team to update marketing and communications material – from fee reports to business cards and signage to t-shirts. We have worked with the team to review their designs and develop their understanding of how the brand can be used to its full potential. It provides guidance on every aspect of using the brand, including how to use the branding in different environments, logo spacing and colour codes for printing, as well as how the branding shouldn’t be used. We also provided Nugent with information about using the brand in terms of accessibility (such as colour contrasts) – making the brand tangible and accessible for all of their service users. We have given them full creative control, whilst still providing some guidelines and feedback in order to support them in the process. This allowed them to express their creativity, whilst also ensuring that the brand is represented in the best way possible. It also demonstrated to them that we intended to support the rebrand through launch and beyond.